GARDEN CITY, NY — Onra Host Corp., a provider of Shared Hosting, Reseller Hosting, and Virtual Servers, best known for their “Packageless” services, formally announces a rebranding, adopting the name OneHost. 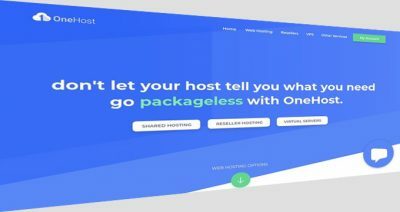 Along with the new name, OneHost has launched a new website, updated control panel, and newly improved ordering interface. OneHost also announces they will be offering innovative new services periodically throughout 2018. Other services will continue to be offered, such as managed WHMCS instances, managed cPanel servers, and managed mail servers. For more information, please visit https://www.onehost.com. OneHost is a web hosting company located in Garden City, NY, with services available in Los Angeles, New York, and Amsterdam. Founded in 2012, OneHost has quickly grown to a large-scale shared hosting, reseller hosting, and virtual server provider, providing services to clients in over one hundred countries. This entry was posted on Friday, January 5th, 2018 at 8:48 am	and is filed under Featured. You can follow any responses to this entry through the RSS 2.0 feed. Both comments and pings are currently closed.